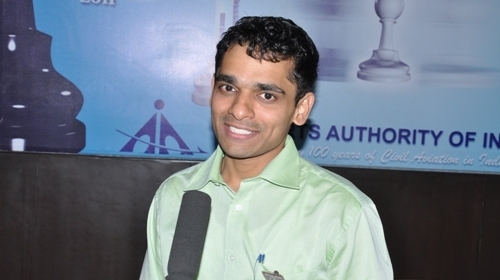 Grandmaster Krishnan Sasikiran became the new Champion of India after winning the Bhavarlal and Kantabai Jain 51st National Premier Chess Championship that was held on 17-30th December in Jalgoan. Sasikiran concluded the tournament in style, by defeating IM Shyam Nikil for the total score of 10,5/13 points. Sasikiran’s nearest followers GM Adhiban and GM Lalith Babu were also victorious in the last round to finish the event with 10,0 and 9,5 points respectively. The Championship was organized by the Jalgoan District Chess Association & Jain Sports Academy. The playing format returned to the round robin with 14 players.